It's Laura here today with a new challenge for you, and that is to create something "Halloweenish" from supplies that were not originally intended to be so. This all started when I was looking at my Public Library label stickers and saw the big orange one and thought to myself if I added a face I could probably make it a cute jack-o-lantern. So that's what I did, and it is the focal point of my card. I used a sharpie marker to draw on the eyes and nose, and then I cut the smile out of black cardstock and glued it on. I could have just used a marker but I didn't want to ruin the sticker if I made a mistake. Then I just added a brown stem, and curled some white floral wire and colored it green. The rest of the card uses Daily Flash letter stickers in Halloween colors, and I pulled out the actual Halloween line, Witch Hazel, and used it to create a little scene around my label sticker pumpkin. For a little bit of added fun I pulled out some black glitter glue and coated the pumpkin's face, and the bat stickers. I also have the amazingly talented Roree playing along with me, and she made an amazing jack-o-lantern card from the 9 to 5 line. I think it's just adorable and I know you will too! I loved Laura's idea for using non-Halloween theme products for a Halloween theme project. I definitely tend to buy more product that I can use for multiple occasions than not. I went searching through my OA products and thought that the 9 to 5 collection would work well for just such a challenge. I created my pumpkin using Boardroom, Girl Friday, Meeting Minutes, and Steno Pad patterned papers. Instead of going with a classic black for the Jack-o-Lantern look, I opted to use the Boardroom wood-grain pattern. I then added some orange stitching on the Meeting Minutes layer to give it some texture and finished it by adding a Flower Sack die cut sentiment and a couple of buttons from the collection. I did fudge a little by adding a sentiment sticker from the Witch Hazel collection. But all-in-all, I think I came pretty close to meeting Laura's challenge. Thanks so much for stopping by today, I hope you are inspired to turn some of your other supplies into Halloween fun! Please share your projects on our Flickr group, and use the hashtag #octoberafternoon on other social media platforms so we can see all your awesome designs! The first thing we are going to do is decide what our banner will say, if anything at all. I chose mine to say "Halloween" so I knew I needed 9 bases for my banner pieces. When I was creating this project, my Silhouette blade decided to break, so I had to create my bases manually, but you can certainly use your die cutting machine to create the same thing, more quickly. I decided that my bases would start with a 5x7" rectangle. I cut a variety of patterns in black and white from Witch Hazel and laid them out once I got all 9 pieces trimmed with my trimmer. This way, I new what order I wanted them to hang when completed and I kept them in the same order, stacked during my entire project, so I wouldn't lose my pattern. Next up I decided that I wanted a double-pointed flag for each of my banner pieces. I found my center point (2.5") of my base and measured up 2" from that center point. This will now be the center point for the apex of my triangel that we are going to trim out of the bottom of the base. Using your ruler and exacto knife, carefully cut from the center point that we just measured, and cut down to each of the corner edges of the rectangle. This will create a perfectly centered triangle from your banner base piece. Continue to cut all of the 8 remaining pieces. Now, go through your papers and match them up with a coordinating, but opposite contrasted paper. For instace here my background paper is lighter in tone, so my next layer of paper is a deeper tone -creating nice contrast between the papers. Once you have decided which papers you want to match up with your background base pieces, trim rectangles that measure 4" x 4.5". It is a rectangle that is just slightly longer, vertically. Match up all of your banner bases with their coordinating second layer. Adhere that piece, centered on your banner background. Next up we are going to layer our burlap. I had this burlap ribbon that was pre-cut to 2.75" wide. If you only have burlap sack material, you can certainly just cut those into strips. I did not measure the length of my burlap, I simply trimmed each piece to slightly over the top of my banner and then slightly longer than the apex of the trimmed out triangle from my base. Then I (once I went out and was able to get a new blade for my silhouette) I used my silhouette to create the letters for my banner using the "Lincoln" font and cardstock.Each letter measures just under 4.5" high. Here is where you would adhere your burlap and letters with fabric glue, if that is the route that you'd like to take. Because I can't create a project without sewing, I stitched on my burlap and letters along with adding a zig zag stitch around the perimeter of my rectangular paper and a straight stitch around the perimeter of each background flag. The last piece of construction involved punching holes, 1 in each top corner, in the background flag, making sure they are placed far enough from the edge that they won't tear under the strain of holding the weight of much of the rest of the banner. I used another burlap ribbon for this portion, but again, any ribbon will do. Once you have punched all of your holes, use your brads to hold your ribbon in place. Using brads stabilizes your banner, still allowing for the movement necessary to create a nuce curve when hanging. For my ribbons in between each banner flag, I spaced the ribbons about 2.5"-3" apart. I also cut my ribbon into segments only a bit longer from this spacing, to save ribbon. I taped down the fray of the ribbon on the back to add more security to the piece. Once the whole thing is pieced together with the ribbons and brads, hang it up to see how the whole thing looks and fits. It certainly looks great already! I definitely could have left it just like this and been happy. 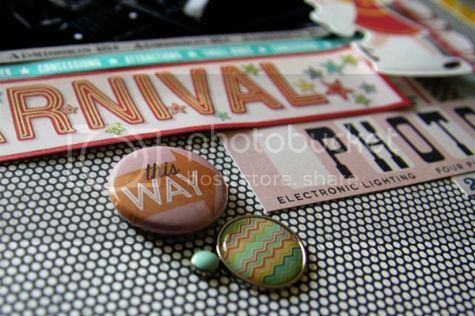 However, I wanted to add some fun embellishments to add dimension and interest, especially for my kids' entertainment! ;) By hanging up my piece (or setting it out on the floor) it makes it easier to see just where you'd like to begin adding the fun details! I used digital cut files, chipboard that I sprayed with SprINKlers, chip buttons, plastic buttons, brads and more burlap twine. Here's a look at some of the final details for my banner. I hope you enjoyed learning how to create a fun banner for Halloween! Witch Hazel is one of my favorite OA lines ever and is just perfect for a banner like this and I know we will enjoy this in our home for years to come! Hi everyone! It's Mandy Koeppen bringing you the Thursday Sketch. Thanks to some helpful inspiration from my favorite Aussie friend this fun and funky sketch is full of circles, layers, and arrows. 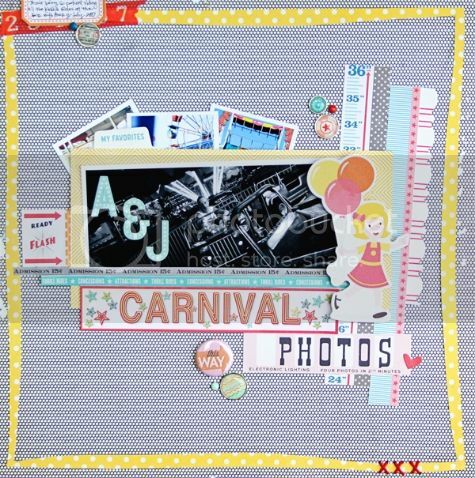 It can be easily made to fit your scrapping style just like Jill and I have done. 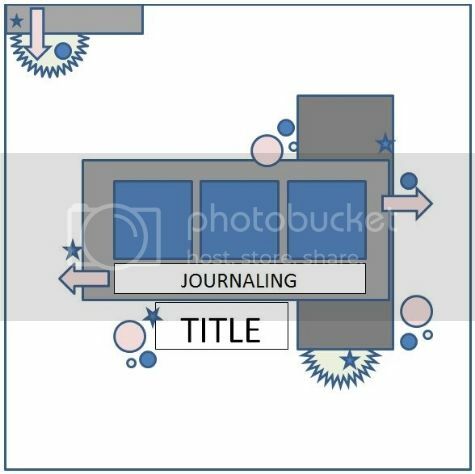 Here is the layout I created using the sketch. I kept the 12x12 format but decided to use a 3x6.5 inch photo and tucked the 3 smaller photos on the sketch under my main photo just to make it more me. Of course once I did that the whole layout changed but that's the great thing about sketches you can make it your own. 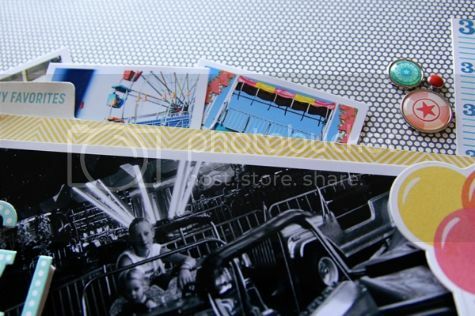 The photos I used on this layout are from a trip to the fair a few years ago which made grabbing the Midway line a no brainer when I was gathering supplies. 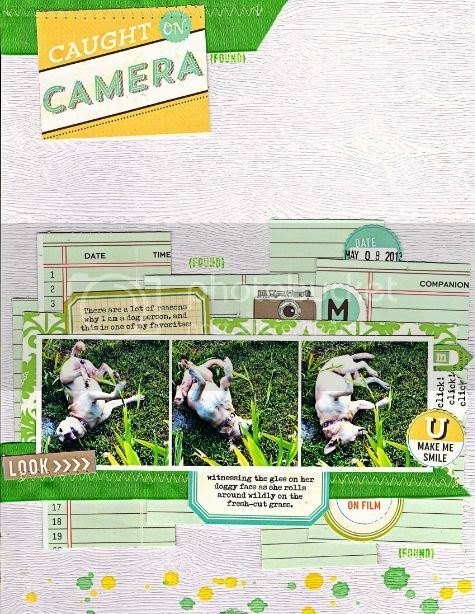 Along with Midway I used a couple pieces from Travel Girl, Farm Girl & Witch Hazel lines to create this layout. Joining me today is Jill. She created this beautiful layout. woodgrain-textured cardstock as a backdrop, since the photos were kind of earthy.